Valencia CF: Gary Medel to join Valencia CF? 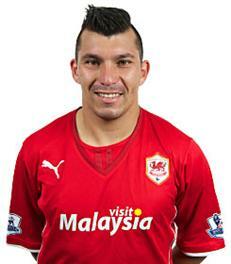 Gary Medel to join Valencia CF? Spanish media are reporting that Valencia CF is seriously interested in the Chilean player Gary Medel who is currently playing for Cardif City and before he played for Sevilla for 2 season and wouldn't mind returning to Spain, as Cardif City have been relegated to the second league in England if I'm not mistaken. Gary Medel is a defensive midfielder and has played over 100 times in Europe as well as represented Chile 59 times, an experienced player and in his prime at 26 years of age. He will be a decent replacement for Javi Fuego, though I don't know how quality of a player he is. I know he was considered very good when playing for Sevilla, but since then I haven't seen or heard much about him, so if we have people who follow the premier and/or the Championship league please share your knowledge in the comments about Gary Medel. I think Gary Medel is going to be an upgrade over Javi Fuego no matter what, but how big of an upgrade and can he displace Keita as the starter is up in the air. Plus as far as I'm concerned we need someone more of a replacement for Parejo, since we don't really have anyone who is a playmaker or box to box player, I mean yeah we have Ever Banega, but he has been playing poorly even in Argentina in a lower level league, so how good can he be in Spain at a higher level? So we'll have to wait and see how things shape up, but there are going to be big changes in Valencia CF that is for sure and we are going to see a lot of players leaving and arriving this summer, I just hope the staff builds a championship winning Valencia CF that can compete with the top teams!